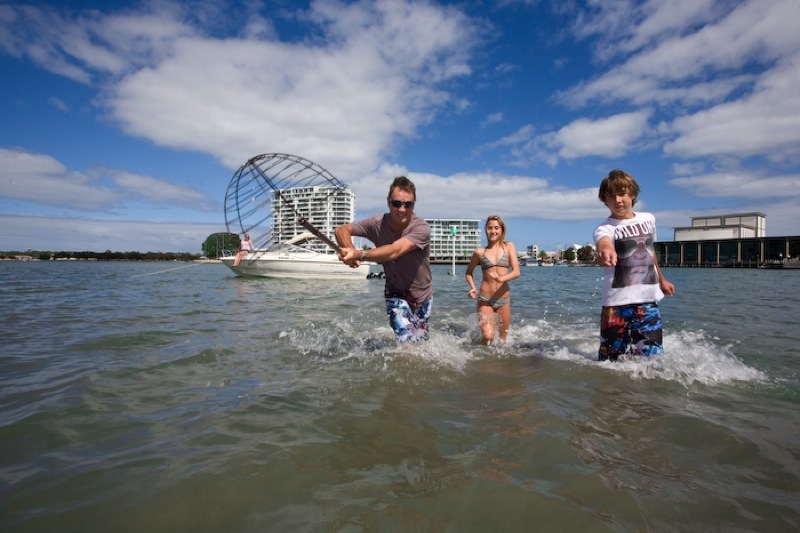 Attractions in Mandurah With so much todo, You'll fall in love with the Peel Region. The Peel Region is a fresh wonderland of water, from surging surf to babbling brook to peaceful estuary. 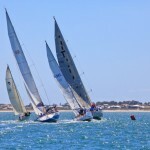 The variety of water-based things to do in Mandurah and surrounds is spectacular. In this diverse environment, you can discover some of WA’s finest natural assets. The area is blessed with some of the most pristine beaches on the south-west coast, and it’s surprisingly easy to find a quiet cove all to yourself. Visit one of the region’s many National Parks. Take a picnic to enjoy the full spectacle of Serpentine Falls anytime of the year. At the Creery Wetlands, you can view over 80 bird species, and islands teeming with unique native plant and animal life. You might choose to travel there by canoe. Lake Clifton is the place to find the extraordinary thrombolite formations, living fossils that have sheltered in these shallow waters for millennia. Home to over 70 dolphins Mandurah’s waterways are the perfect arena to spot one of our frolicking locals and their calf. For fishing enthusiasts, the beaches, the estuary, the lakes and the rivers are easy to access, and deep-sea fishing charters are simple to arrange. 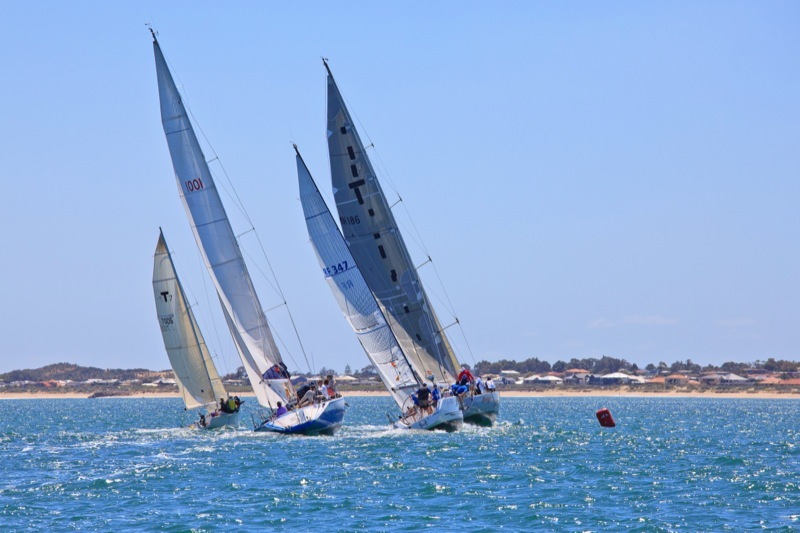 Mandurah is a water playground, with its world-class marina, pleasure boats and pontoons for hire, and a huge range of experiences on offer. Crabbing is a local tradition, and it’s easy to cast a net from a local jetty or a dinghy and pull up tasty blue swimmer crab. There’s great surfing to be had, and divers can explore an historic shipwreck. For a more leisurely day, any time of year, voyage along the estuary on a scenic dolphin cruise. 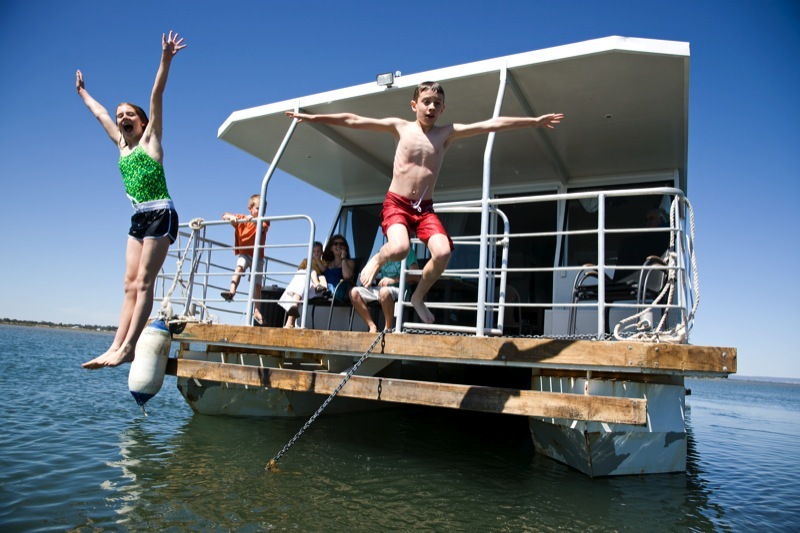 Hire a boat, kayak, canoe or paddle boat and explore the vast inland waters, including the Murray River and the internationally listed Peel-Yalgorup wetland system. Have a slow paddle down the Hotham River or get your adrenaline pumping with white-water rafting at Baden Powell during winter, or a jetski tour through the Mandurah estuary in summer. The region is really attuned to families (and it’s so close to Perth that before you hear “Are we there yet?”, the answer will be “Yes”). Give the whole family a ‘hands-on’ zoo experience at the Peel Zoo. 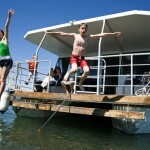 You’ll find over 100 species of birds and animals, including Tasmanian devils and wombats. It’s a carnival every weekend at Mandurah’s King Carnival, with a ferris wheel and dodgem cars, as well as bungee trampolines and inflatable castles. It’s a kid’s wonderland. 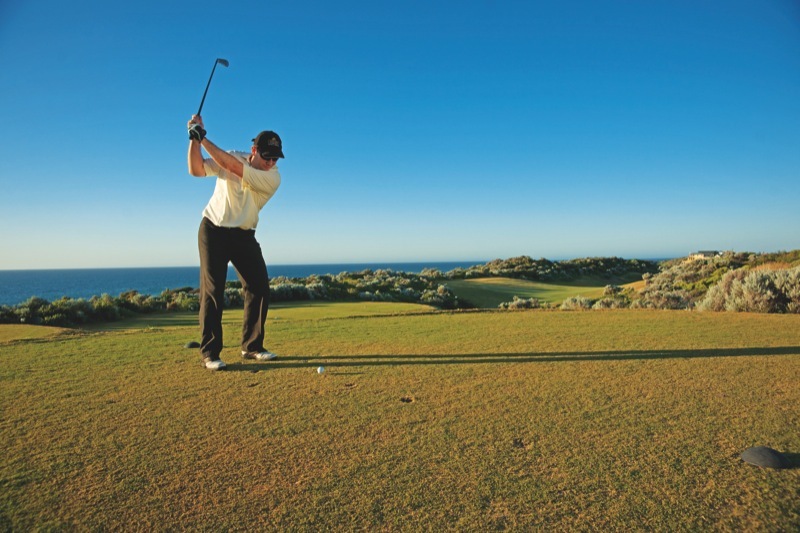 Voted Western Australia’s number one golf course in 2008/09, ranked in the country’s top 20 public access courses, and in the top 25 overall courses in Australia, The Cut is a must play golf course for all golf enthusiasts visiting Perth and the Mandurah area. The Cut is complete with state of the art facilities including a modern clubhouse with well equipped locker rooms, as well as a golf shop and restaurant, which are all open to the public. Additionally, The Cut’s full size driving range is the perfect way to warm up prior to playing this magnificent links golf course. With green fees including the use golf carts, what more could you ask for? The Cut is Perth’s only true Links golf course, which draws similarities to the great links courses of Ireland and Scotland. 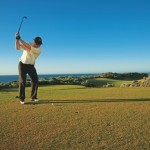 Come and play The Cut – a “True Links Experience”. We are able to recommend a number of our local beauty clinics depending on your needs. The region presents a wide range of relaxed shopping experiences, from charming country stores, to shiny city shop fronts, to the excitement and colour of open-air markets. Mandurah city offers a variety of fashion boutiques, art galleries, gift shops and other retail outlets, in sophisticated open-air malls as well as a range of shopping centres. Look for inspiration along the waterfront shopping boulevard, wander the stalls of a farmers’ market, browse handmade treasures, discover unusual collectables, or pick up a case of your favourite varietal at a boutique cellar door. Inland, the lovely patchwork of townships, farmland and vineyards is a trove of antique emporiums, roadside stalls, art and craft galleries and village stores. Fine wood crafts are a highlight of the Peel Region, with great skill and superb materials on display in a number of places, perhaps most notably in the gallery of Dwellingup’s Forest Heritage Centre. The Mandurah Performing Arts is the home of visual and performing arts in Mandurah and Peel Region of Western Australia. The Mandurah Performing Arts Centre was formally opened in June 1997 funded by the WA State Government and the City of Mandurah. The Centre’s facilities are designed around glassed foyer areas which offer sweeping views over the city centre and Mandjar Bay. Comprising the Boardwalk Theatre, the Fishtrap Theatre and the Alcoa Mandurah Art Gallery, the Centre is an icon for the performing and visual arts in the Peel Region. Click here to find out what’s on!